GE’s Masoneilan 49000 Series is designed for the most demanding applications combining high capacity flow with extreme pressure drop. The large flow galleries are designed to accept VLOG Energy Management technologies while offering an overall optimized engineered solution accommodating large stroke lengths and up to 36 stages of pressure reduction. 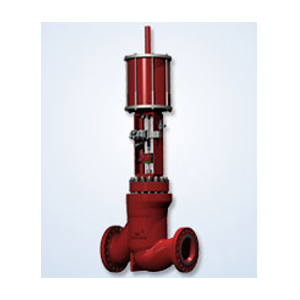 The valve platform allows the ability to have expanded or reduced inlet and / or outlet body connections whilst maintaining the flexibility and capability to accommodate complex piping arrangements. Typical applications include boiler feed water start-up and control, steam let-down, pump discharge, water reinjection, gas recycle and vent applications.